The eponymous British High Street is on the verge of its biggest crisis since 2008. 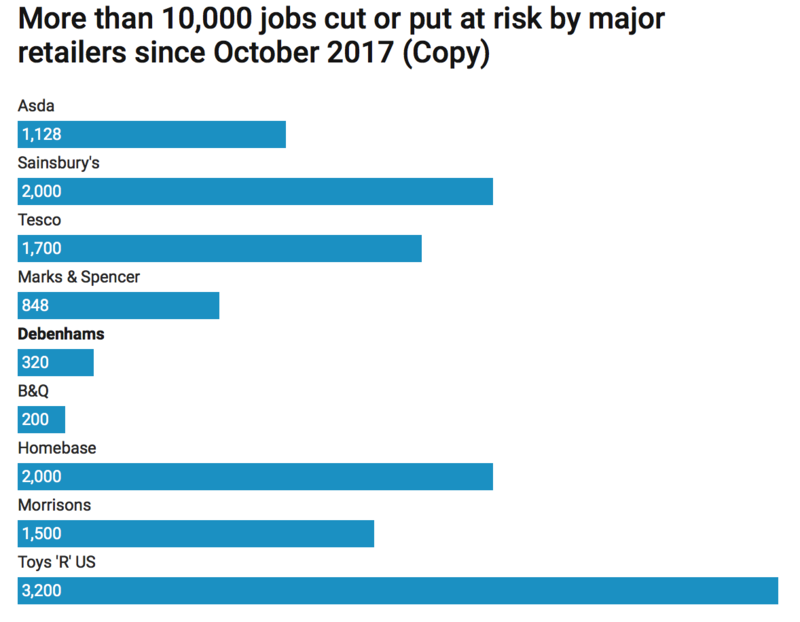 According to The Centre for Retail Research up to 200,000 retail jobs could be gone by 2020, this is in addition to the 150,000 that have disappeared since 2016. Many household chains are scrambling to negotiate with creditors in order to avoid collapse and total wipeout. In 2018 alone eleven high street retailers have gone into administration, Professor Joshua Bamfield of the Centre for Retail Research has warned that 1 in 10 shops could disappear in the next two years. Whilst the government has been called on to help this isn't something that is easily resolved. Chancellor Philip Hammond is being lobbied to reduce business rates, however this is just one problem amongst many. In all likelihood it is the only problem which can be directly resolved by the government. Larger (more potent) problems such as Brexit uncertainty, inflation and reduced household spending are out of anyone's control. With Brexit now less than one year away many are asking if this is something that can ever be resolved. The cause of the problem is a mixture of the aftermath of an unresolved financial crisis and the economic effects of Brexit. The uncertainty following the referendum and the resulting currency-driven inflation has without doubt reduced shoppers' keenness to let loose on high street, but this outcome was inevitable given the real lack of progress following the financial crisis. It is estimated that one pound in five is spent online. Not only are retailers having to compete with the countless reams of websites that now offer a more engaged shopping experience but they are facing a market that is heavily indebted, losing jobs, stagnant wages and facing unknown changes in the coming months and years. At the end of February two major high street fixtures, Maplins and Toys R Us, announced their collapses within two hours of one another. Each are thought to be responsible for up to 3,000 members of staff losing their jobs. This is not surprising reading. Last month Visa said the British high street had had its worst start to the year since 2012. Inflation-adjusted consumer spending in February was 1.1% lower than in 2017, after a 1.2% decline in January. “As we look ahead into March, consumer spending is at risk of posting one of the worst Q1 results on record,” Visa’s chief commercial officer, Mark Antipof, said. The collapse of the UK high street has been ongoing for nearly a decade. In 2008 Woolworths went under, with 30,000 employees out of work. Since then the likes of MFI, Borders, Comet (one of many white goods firms to go bust) and JJB sports have lost out to the struggling economy. The most recent victim on the British High Street is department store House of Fraser. It is responsible for the jobs of 5,000 direct employees and 12,500 concession stand staff. Last Friday the owners announced EY had been called in to try and help with a dire financial situation. The company is desperately trying to renegotiate rental arrangements whilst navigate its way around hundreds of millions of pounds of debt, £350m of which is a publicly traded bond. In the background Carpetright is due to close stores (2,700 employees), stark profit warnings have come from Moss Bros (1,350 employees), B&Q’s owners are in trouble (25,000 employees) and Mothercare (5,200 employees) are in ongoing talks with creditors. With the economic situation as it is and changing shopping behaviours there seems to be little let-up for the high street retailer. Whilst this makes stark reading now, it will have profound long-term consequences on an economy which is increasingly finding itself with several thousand retail workers without anywhere to turn to. Despite what the government might tell you inflation really is biting at the heels of households. If one considers that it is mainly appearing in food, transport and housing costs then you have accounted for around (at least) 50% of a household's spending. This is non-discretionary, so what will suffer? Shops. What is discretionary is purchases of non-essential items. Households that are feeling the pinch through wage stagnation, inflation and the impact of Brexit are unlikely to just buy on a whim anymore. Inflation has been rising at a faster pace than wages for some time now. Officially the government has only just noticed this since the Brexit vote which has resulted in imported currency-related inflation. But, in truth it has been around along-time, evidenced by shrinkflation and increasing levels of consumer debt. Conversely, spending is climbing in one area - online shopping. Consumers feeling the pinch are more willing to spend online where they can hunt out bargains, save money on transport to the shops and reduce the chances of overspending whilst shopping. At the moment one in every five pounds is spent online, this is likely to increase as habits evolve. It's not just on the UK high street where consumers have decided to rein in their spending. The new car market is also feeling the impact of the economic downturn. According to Ratings agency Moody, new car registrations are likely to fall 5.5% this year, making the UK the 'worst performing' market in Europe. This will make the second year in a row that car registrations are down, bringing the fall to 10%. In stark contrast to the UK, Spain and Germany Spain and Germany will see new registrations climb by 4.7% and 4% respectively in 2018. The UK motor market is just one example of problems outside of the UK retail sector. Consider the reduction in bank branches, post offices and other public service outlets. In his Spring statement Chancellor Philip Hammond tried to give a rosy picture of the future of the UK economy. He assured the House of Commons that not only would growth be at 1.5% for 2018 but that debt would represent a smaller proportion of GDP by the end of the year. This was a lot of political rose-tinting though. 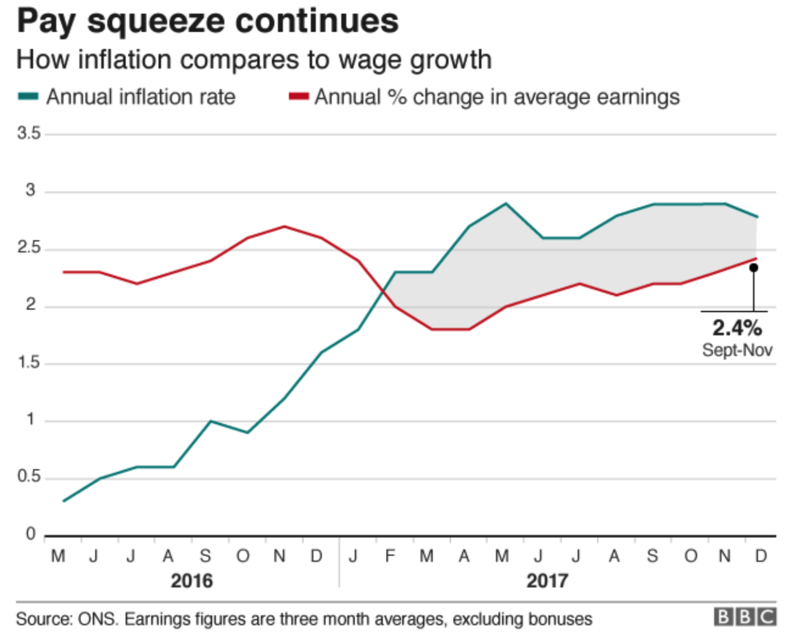 Paul Johnson, director of the Institute of Fiscal Studies told the BBC that none of this meant very much, 'The UK economy was now 14% smaller than would have been expected, based on pre-crisis trends, while median earnings remained below their 2008 level. How will this reduction in consumer spending really impact the UK economy? Clearly no-one really knows but you can gain a fair idea when you consider that domestic consumer spending makes up the largest part of British economic demand. With over 200,000 people losing their jobs that's a significant number of people now dependent on the UK government. This is not only for unemployment benefit but also for long-term support such as their pensions. 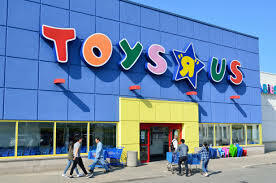 The Toys R Us defined benefit pension fund, which has an estimated £37m deficit, is one such whole the government will have to plug. Other high street retailers collapsing also have very red pension funds. The British tax payer will no doubt end up propping those who now face a retirement without a pension. Sadly much about the above situations were unavoidable. After years of rapid debt-fuelled expansion, rising inequality and growing nationalism across Europe it was inevitable that we would step out to find our high streets in such a state. There is also something inevitable about how this will end. But, what happens to your wealth, investments and savings is not a given. At the moment savers are still able to use what is the calm before the storm to reallocate their portfolios so they are well-balanced and protected against the aftermath of easy monetary policy and political fallout. Investments such as gold and silver by their very nature are immune to the effects of inflation, stagflation and the dangerous ideas and experiments of central banks. Gold has just completed its most successful three quarterly run since 2011. This should offer two key signals - the first that safe haven demand is on the up as buyers become increasingly wary of the outcome of political and economic decisions and, secondly, that now is an ideal time to prepare your portfolio against even more upset in the marketplace.